Did 'Scrappy' 3rd-Party Groups Sway Election? They registered in droves and enjoyed record-high spending limits, but did special interest "third-party" groups actually make a difference in the outcome of the federal election? ​They registered in droves and enjoyed record-high spending limits, but did special interest "third-party" groups actually make a difference in the outcome of the federal election? According to Elections Canada, the 112 registered third parties have until Feb. 19, 2016, to disclose details of who donated cash to their campaigns, and how they spent the money. The 78-day campaign allowed each group to spend $439,410, more than double the eligible amount for a regular 37-day writ period. Advocacy group Leadnow channelled its resources into 72 swing ridings to build blocks of voters to defeat the local Conservative candidate. Campaign manager Amara Possian said the group ended up spending "far below" the caps because it relied more on face-to-face conversations than paid advertising. "There was a national wave, to be sure, but in a handful of close ridings where the results hinged on razor-thin margins, our months of dedicated planning, organizing and heroic work by volunteers made a difference," she said. She pointed to a "scrappy operation" in the Manitoba riding of Elmwood-Transcona, where she believes efforts led to the recommended NDP candidate's victory by just 51 votes. And in Calgary Centre, the group's recommended Liberal candidate took out the Conservative for the first time in 47 years. Brian Singh, committee director for 1VoteMatters, believes third-party groups that pushed strategic voting had a significant impact that is tough to quantify. "Everywhere we targeted, we had a very good rate of success," he said. "But were we solely responsible? No." Singh said the dialogue began months ahead of the campaign, and built momentum. He sees a "start-up" movement of Canadians who care deeply about politics but are turned off by partisanship. "Everybody has a party of the electoral system they want to target, and they want to represent that in terms of how they get their vote heard, as well as how they can shift the vote," he said. The spike in number has raised concerns about whether some are "fronts" for political parties, or whether one organization could extend its spending by splintering into several groups. Elections Act rules prohibit a third party from splitting itself into two or more entities or colluding with others to exceed the spending limit. Foreign contributions for election advertising are also banned. Canada's former chief electoral officer Jean-Pierre Kingsley believes there is adequate oversight in place. His key concern is that the spending caps for third parties — and the larger political parties — were too high because of the extended campaign. "It took us 40 years to go from a laissez-faire regime to one that was the best in the world. He threw that out the window in one fell swoop," Kingsley said of outgoing Prime Minister Stephen Harper's "shocker" decision to call a 78-day campaign. Kingsley said there must either be a fixed election campaign period of approximately 37 days, or the spending limit must be fixed no matter what the duration. But Anthony Sayers, a political scientist at the University of Calgary, believes even the higher limits allow relatively "meagre" spending. "Given what modern [party] campaigns spend at both levels, it would be hard to argue that parties and candidates do not have the resources to repel or respond to third-party campaigns," he said. "The anti-Harper groups that proliferated during the recent campaigns may have had a general effect in encouraging annoyance with the government, but it also seems they spent much of their money during times when it's not clear voters were paying much attention." Sayers said the heightened participation of these groups is likely a sign of a healthy democracy, allowing the expression of voices that aren't often reflected in the main parties. But he thinks it would be difficult to prove the actual impact on the electoral outcome because so many factors are at play. Duff Conacher, co-founder of Democracy Watch and a visiting professor at the University of Ottawa, called for a task force to review and revamp the rules based on various campaign periods. "Election campaign spending limits should not double just because the campaign doubles," he said. "There's two ways of doing it — putting a firm cap on the limit, or better, put a limit on the length of the campaign." A third party must register immediately after exceeding $500 in advertising and expenses during the official campaign period. 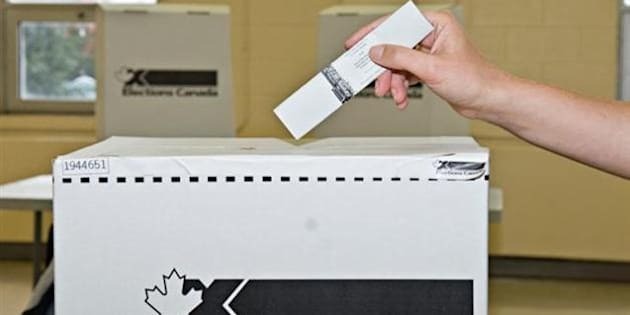 In addition to the total limit ($439,410 for this year's 78-day campaign), no more than $8,788 of the total can be spent in any one of the 338 ridings.